I was a mall rat in high school. Every week, my friends and I spent hours at the Arcadia Santa Anita mall shopping for baggy jeans and baby doll crop tops, trying on shades of brown lipstick at Garden Botanika, combing for cute boys with our eagle eyes, and even putting in a few AP Biology cram sessions at the food court while nibbling on Sbarro's baked ziti. We thought we owned the mall. Little did we know, we were just a couple of big fish in a small pond. My first visit to the Beverly Center was freshmen year in college. My friend and I made the drive from USC for some retail therapy after a particular grueling midterm. Although the mall is a straight shot from the 10 freeway, I got lost trekking down La Cienega Blvd and ended up zigzagging my way up there. Once inside, I was greeted by the sheer monstrosity of the mall's size and stores I'd never heard of. I felt like the country mouse visiting his city friend and exploring a whole new world for the very first time. I wasn't in Kansas anymore. I was a small fish who had just leapt into the uncharted waters of the LA river. Luckily, I didn't drown! Over the years, the Beverly Center has become one of my favorite shopping destinations so I was super excited when they invited me to be one of their "Show My Your Style" bloggers! With just $125, I shopped and put together a head to toe outfit with the majority of the pieces purchased at the mall. My 90s inspired outfit not only celebrates one of the biggest fall trends, it's also a style tribute to my mall rat days! 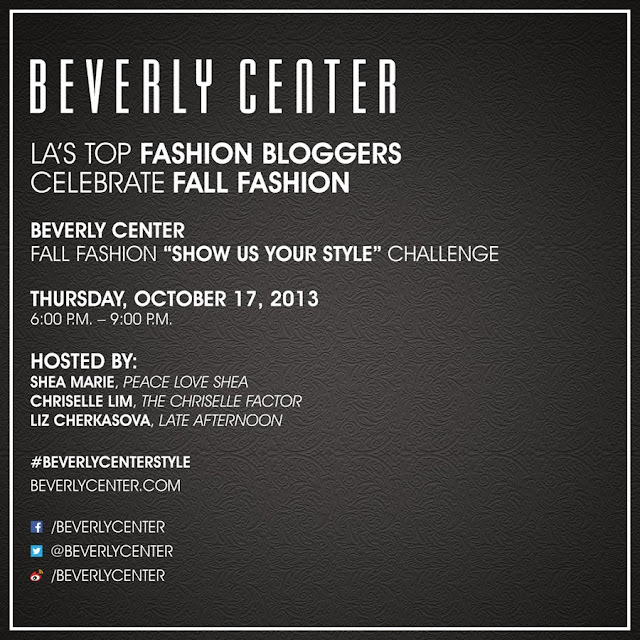 Go to the Beverly Center facebook page to vote for your favorite blogger look and I hope you will join me at the mall on October 17 for a fabulous fall fashion party! That necklace goes so well with that outfit! Love it! This outfit has everything that's trening right now! 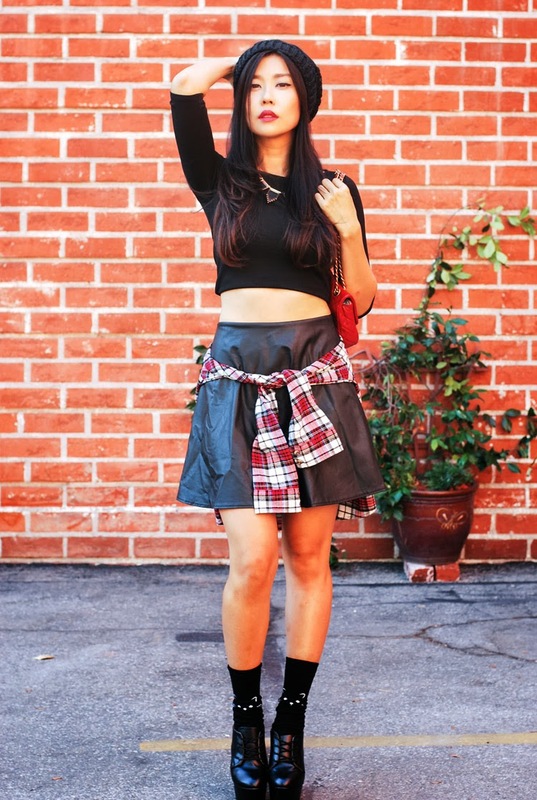 :D You've got the flanell shirt, black leather boots, the skater skirt and a wool crop top. She is very pretty, probably because of what she is wearing or the makeup she has on. Beauty and fashion go hand in hand in making a person beautiful.